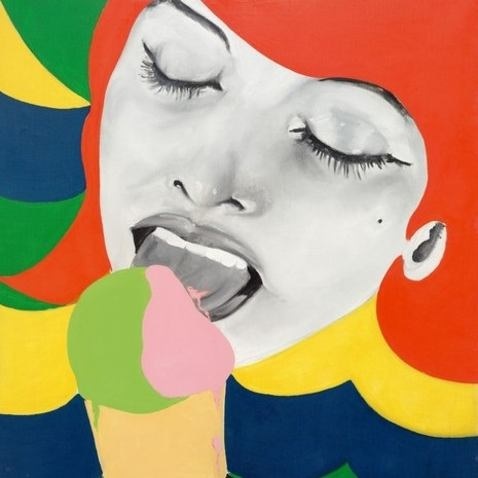 The painting, depicting a woman licking an ice cream cone, is by one of the first female Pop artists, whose work, according to a Philadelphia Museum Tumblr post, “can be understood as a critique of mainstream Pop Art, in which women were often depicted as passive, decorative objects. In contrast, Axell sought to depict active, confident women who pursue satisfaction on their own terms—such as the protagonist of Ice Cream, who unabashedly enjoys her dessert.” The image can also be seen on a billboard ad on the Schuylkill Expressway in Philadelphia promoting the exhibit. The painting (and many others) will be on view at the art museum from February 24ththrough May 15th.